Gutters and downspouts play an integral role in protecting our homes from the damaging effects of water. Properly installed gutters and downspouts can save money and a great deal of headaches down the road and are worth their installation costs many times over. Without gutters, during a rain storm the water flows down our roof structures, off the eave of the home, and lands near the base of the home. Another common occurrence is the deterioration of exterior doors and door frames from the constant contact of water flowing off the roof and landing at the base of the home. Most of these moisture problems can be avoided with the installation of gutters and downspouts around the perimeter of the home. At Mid South Insulation, we understand proper water drainage can save a home from the damaging effects of water. Whether you’re constructing a new home or investing in a home improvement project, Mid South Insulation is here to help you succeed. Why Choose Mid South Insulation? We understand that no two homes are alike. 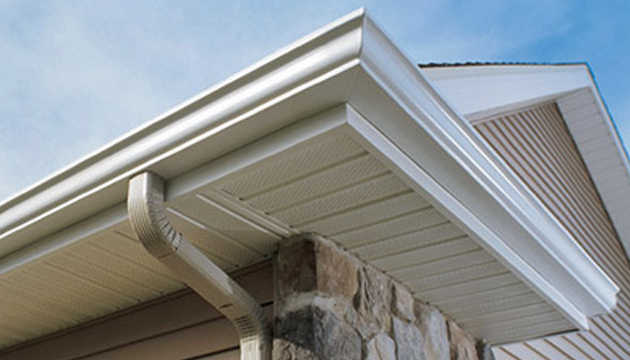 You can select the perfect gutter color to compliment your beautiful home. Our gutters are also available in 5 and 6- inch sizes. Keep your gutters in excellent condition with screen gutter covers that prevent leaves from clogging your system. This extends the life of your gutters while protecting your home. The cost to install gutters and downspouts will be worth the thousand of dollars in repairs and headaches that will likely be avoided down the road. Mid South Insulation is here to help. Interested in learning more about our residential gutter service? Contact us today at 615-672-0752 to learn more about how Mid South Insulation is Middle Tennessee’s premier gutter repair, and installation company.